In this essay, historian Ian Gordon describes how he uses Thomas Eakins’s painting The Champion Single Sculls to explore America’s cultural and economic transition to modernity in the late-nineteenth century. Thomas Eakins, The Champion Single Sculls (Max Schmitt in a Single Scull), 1871. Oil on canvas, 32 1/4 x 46 1/4 inches. To see a “zoomable” version of the painting, go to The Metropolitan Museum of Art Website. I use The Champion Single Sculls in a lecture for my class “Making America Modern.” In this class I try to combine both cultural and economic history. At times my approach in lectures is a bit crude following a base and superstructure model, but by the time the class is completed I hope students have gathered that these matters are rather complex and not so easily slotted into neat categories. I use the painting as a case study in analysis so that students have some ideas to work with for projects they undertake looking at images and/or films (such as Charlie Chaplin’s 1936 film Modern Times) and writing short response papers. In class I use the image to talk about a range of issues. I start with some of the more immediate observations. Towards the upper right hand corner of the painting there is a slight puff of smoke. On close examination the viewer can make out a locomotive smoke stack and this observation segues into a discussion of both the expansion of railroads and the increased use of iron and steel in construction. I note the construction of the two bridges in the distant center of the work with one a masonry and steel construction and the other all metal. That the location of the painting is on Philadelphia’s Schuykill River lets me make a direct link to the Baldwin locomotive company of Philadelphia that grew rapidly during the Civil War. I generally make a little joke at this point about war truly being the locomotive of History, to borrow a phrase from Leon Trotsky. At this point, too, I generally mention that the USA’s production of iron and steel grew rapidly and that by the 1890s it had surpassed the combined output of the United Kingdom and Germany. I then turn to the sport of sculling and its international popularity in the late nineteenth century. I show an illustration of a sculling contest from the Australian journal The Bulletin to make this point. I offer some broad comments on this sport as but one exertion of masculinity in an era that saw the rise of new sports and sport as a means of expressing identity both for participants and observers. 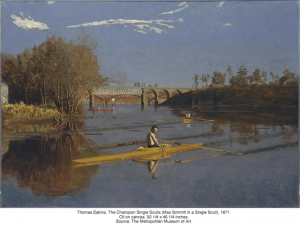 I then note that I generally call the painting by its alternative title Max Schmitt in a Single Scull, which highlights the celebration of champion oarsman Schmitt, but also the artist Thomas Eakins who was a friend of Schmitt and a fellow sculler. Here I point to Eakins’s signature on the back of the second scull in the middle distance slightly to the right (the signature is just visible on the Metropolitan Museum of Art’s website version of the painting, which has a zoom feature). I then talk about Eakins positioning himself in the painting and the claim to masculinity he stakes in doing so. Unlike Schmitt, Eakins did not serve in the Civil War, instead paying for someone to serve in his place. I also suggest that Eakins is saying that he as a painter can produce such a work both because of his skill as an artist and as a sculler. I talk a little about the pride in skill or craft that Eakins exhibits and relate that to his father’s work as a writing master, a craft disappearing at the time of the painting. I suggest that with the coming of the industrial age craft either becomes a hobby or the pursuit of a cultural elite such as artists. Christopher Benfey, “Three Ways of Looking at Thomas Eakins,” New York Review of Books (March 29, 2007). Elizabeth Johns, Thomas Eakins: The Heroism of Modern Life. Princeton: Princeton University Press, 1983. Frank H. Taylor, Philadelphia in the Civil War 1861-1865. Philadelphia: The City of Philadelphia, 1913.